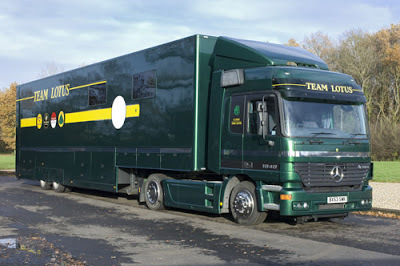 In 2008 Classic Team Lotus, in a way, came of age with the acquisition of a full size articulated race transporter. 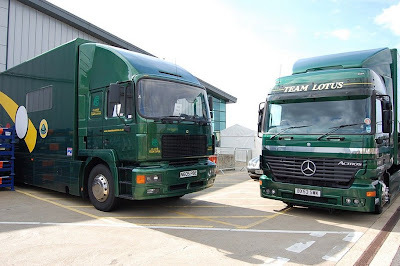 The progression of the company can be measured by its transporters; single car Talbot (dreadful), two car Bedford (ancient), three car MAN (bespoke and good) and now a bespoke artic that can take six cars and, once at the circuit, can provide a large living area for customers and work area for mechanics. In keeping with Colin Chapman’s tendency to fit more in a space than anyone else and to get the most out of everything, the layout from the start had the objective of a six car capacity. A large sliding unit divides the workshop and living areas, providing extra large lockers for drivers. This unit can slide fully forward and the seat bases be re-deployed as ramps to enable cars to be loaded all the way to the front. The chassis was built by DEP chassis, the body by Quality Coach Builders, the tractor unit supplied by M6 Commercials, paint by Commercial Vehicle Refurbishing, cabinet work by Roy McHardy and livery by Paul Banham. After much debate the livery took its cue from the team’s transporter of the Sixties, combined with a contemporary presentation of the team’s historic colour schemes along with the yellow racing stripe and white roundel. Upon reflection, such an innovative design was bound to have its teething problems. Ex Team Lotus and McLaren man Paul Simpson took on the role of equipment supply and troubleshooter and in November we were able to load six cars, eight car sets of tyres, two spare engines, pit scooters, pit cabinets, tool cabinets and …. actually had a bit of spare space. Nick Yallop made it there and back, and a lot was learnt, in readiness for fully efficient operation in 2009. Eu já sabia, mas não disse nada, porque tinha a certeza que tu ias descobrir (lol). Acabamos por contar uma história curiosa, bastante completa e certamente muito rara!